Welcome to the Gina K. Designs and My Sweet Petunia blog hop. You probably arrived here from the super talented Ceal Pritchett's blog. Before I show you how I put my card design together, let me tell you a little about the hop. The design teams from Gina K. Designs and My Sweet Petunia have joined forces to show you some fun projects using both companies' products. 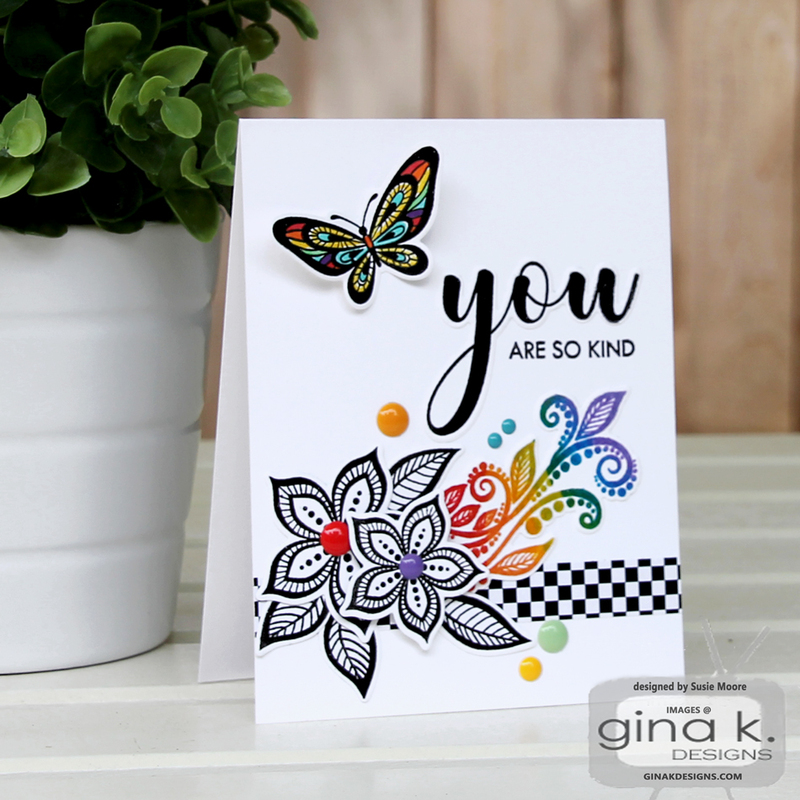 Gina K. has beautiful stamps, dies, inks and papers which go perfectly with the Most Incredible Stamping Tool Invented - the MISTI. Both Gina K. and Iliana Myska have helped to shape the stamping world and we couldn't be happier about that! I first laid out the stamps I wanted to use and then repeat stamped them three times to get a perfect black image on each. I used Versafine Onyx Black so that I could heat emboss the stamped images with Gina K. Designs Clear Embossing Powder. I left a space in the upper left hand corner of my images to add in my swirl stamp. I wanted to stamp it in rainbow colors which was easy with the MISTI. I inked up the stamp six different times to achieve the rainbow look. I could have NEVER done that with a stamp block! Next because I hadn't moved my stamp or paper, I was able to stamp over the image with Versamark and then heat emboss it like the other images. Then I die cut all my bits and pieces. Next I had to figure out the approximate layout for everything. Be glad this wasn't a video, or you might still be watching this step! I adhered my stamped and die cut YOU and swirl so that I could add in the supporting sentiment. I stamped it onto a clear grid to make double sure it would be straight. Then I removed the clear grid and stamped it for real. I absolutely adore my MISTI. I can't even lie...I have four of them. Now that's true LOVE! And what images did I use on my card today? I used the Boho Flowers Mini Kit from Gina K. Take a look because I think you will like it. You will want to hop along to Donna's blog from here. She is one of my VERY talented teammates and I am proud to link to her next. Be sure to comment on all the blog posts in order to have a chance to win two separate prizes. What are they? (1) Your choice of the regular MISTI or the Mini MISTI and (2) the not yet released Stitched Leaves Mini Kit from Gina K. Designs. The deadline for commenting is September 5th at noon central. 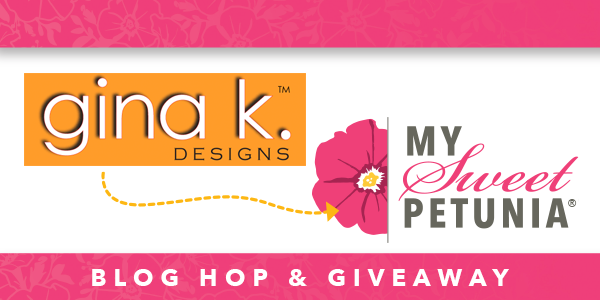 Winners will be posted on the My Sweet Petunia blog winners' page and on the Gina K. Designs blog no later than Friday, September 8th, 2017. I hope you will enjoy our special little hop. Have a tremendous day and I'll see you again tomorrow. 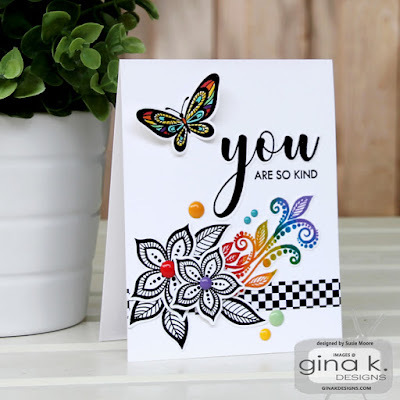 Love that pretty butterfly and the design of your card. Love that rainbow spectrum you created with the spots, that looks amazing! Gorgeous card. Love the rainbow look. Thanks for sharing and inspiring us. That butterfly is gorgeous! I love how you all are showing so many versions and uses from the supplies! Oooh, love that rainbow foliage. Beautiful! Lovely design and happy colors. You make masking look easy! Lovely! What a neat way to put a rainbow on your card! 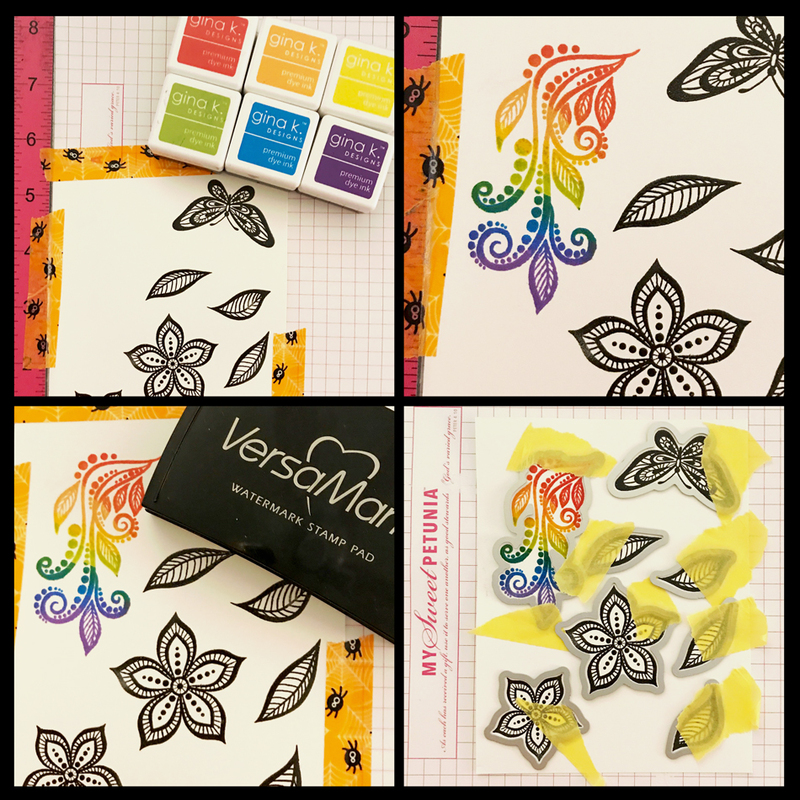 Love your rainbow stamping! And its so striking combined with the black. Beautiful card! Love all the bright colors. Cute card and cool colors! Gosh Susie this is so pretty! This looks amazing with the rainbow colors on the swirly thing! I really like your rainbow. Adds so much! Awesome use of the rainbow colors! Gorgeous card! Looks fabulous with the rainbow colors! Love the colors on the swirl! beautiful card. love this kit! Such a striking card! Love that checkerboard border ... really makes everything else pop! Amazing card Susie. Love all the pretty colors. Love those bright colors on that black and white card. They just pop. Fun rainbow! Thanks for sharing how you achieved it. Beautiful card! So delicate and beautiful and that rainbow....going to have to try that, thanks for sharing how! Loved your card the minute it popped up on my screen......absolutely BEAUTIFUL!! Wow I only have one MISTI but thinking I might need the next size up so will keep watching. Love your cards and ideas. Gorgeous card and a wonderful multi-colored design! Thanks for sharing. This is really pretty with just the touches of color. What a great card! I love the Misti just for all the reasons you described and so many more! Best thing ever! Your card is so pretty with the rainbow flourish and the touch of patterned paper! Thanks for sharing your creativity! Rainbows! LOVE this card! And love my MISTI. I really like the rainbow flourish! Thank goodness for the Misti! Lovely card! So vibrant and cheery! The rainbow flourish is lovely! Wow! The rainbow stamping really draws your eye to the card. Very prettly! Your cards are always beautiful. Awesome! Love the rainbow effect. Thanks for that great tip as well as the great detailed tutorial. Four MISTIs - WOW - though I wouldn't mind having several more myself. It has made such a difference in my stamping. Your rainbow of color is lovely. Love your work and love the colours you used. Beautiful card, love your rainbow colors! I love your car. And what a great idea for the rainbow swirl! Thanks for sharing your technique of using the Versamark over your rainbow colored image. Love it!!! Beautiful card! Love the rainbow swirl! Thanks for sharing! Wonderful card and technique! Totally fun and inspiring!! Beautiful card. Very pleasing to my eyes. very pretty! love how you colored your stamp! Wow! Love the rainbow idea. I will have to try that..
Beautiful card! Love the rainbow stamping on the flourish! I love the way you added color to your card. Thank you for sharing. I really iike your use of rainbow colors. So bright and happy! Love the monochromatic with a pop a rainbow colors. Love the card -- especially the use of rainbow colors!! Love your card! I think I like those Boho flowers best just in black and white! They make such an elegant card when added to those flourishes. Thanks for the tutorial, as well! Nice touch of color and I like the layout. Your cards are beautiful, I love the rainbow flourish! Love the rainbow effect. Lovely card. Absolutely love all the beautiful colors you put in this!! I love the way you rainbow-colored the flourish! So creative! Thanks for sharing! Fantastic stamping. Love the rainbow on your card. I love the rainbow effect. It seems a MISTI would be necessary to get these perfect images. Thanks for sharing your directions. Thanks for the great tips. Love the card! Wow! I so love the multi colored flourish. Thanks for the inspiration. Such a colorful card, very eye-catching! love your card, the coloring on the butterfly and the flourish is wonderful!!! WOW!Your card has so much impact. Coloring the leave in all those different colors using the Boho Mini and the MISTI made it so crisp and special looking. The black and white parts are the supporting cast for the stunning star being the leaf. Beautiful card. Wow, 4 Mistis, that must be fun! Beautiful card! I love the rainbow color with the black and white. Your rainbow with that black, perfection! Thank you for sharing. Very beautiful card with a great work on colours. Super fun rainbow, it really makes the whole thing pop. That rainbow coming out of the flowers and that gorgeous butterfly just grab my attention!! So pretty... love the many rainbow effects. TFS! Love the embossed rainbow stamping! Love your rainbow image!! Wonderful use of the Misty....I must get one. I would love to use that technique with other stamps in my collection. Brilliant...of design and creative thought. Great technique and the result is fabulous. Thanks for the inspiration.